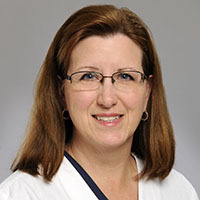 Diane Atkinson, RN, BSN worked extensively in the Neuroscience intensive care and step-down units at Georgia Baptist and helped establish the first neuroscience acute care nursing unit at Piedmont Hospital in Atlanta. In 1997 Diane became the Nurse Manager of the Gamma Knife® program at Piedmont. In 2007, Diane joined the Gamma Knife® Center at Emory Saint Joseph's Hospital. In 2009, she accepted the dual role of staff nurse in Gamma Knife® as well as nurse navigator for patients undergoing high dose radiation procedures (HDR) in Radiation Oncology. Diane assumed the position of Nurse Manager of the Emory Saint Joseph’s Gamma Knife® Center in 2012 as well becoming the Nurse Navigator for patients with brain tumors and brain metastases. Ms. Atkinson graduated from the Georgia Baptist School of Nursing in Atlanta, later obtaining her BS in Nursing from Georgia State University.